We are an animal sanctuary and educational farm that travels to you and shares our furry world, one touch at a time! 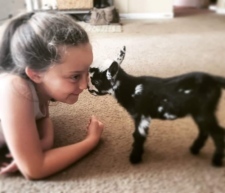 Noah's Ark has been adopting unwanted animals and incorporating them into farm life that delights children for over 21 years... with a stellar reputation! You may schedule field trips here and birthday parties. We also do field trips with our animals to your location for schools, churches or birthdays. Our animals enjoy the outings and your children benefit from the petting therapy! We have been named Tampa Bays best! SPECIAL BIRTHDAYS HERE OR TO YOU! We can plan your child's birthday with our beloved pets as the stars! We bring a 12 animal petting farm and a pony for rides right to you! 310. For 1 hour and 15 minutes. Of fun. You bring your party goods...we supply the location and fur fun. Up to 15 kids. Larger parties are 350.for 2,5 hrs. Summer camp 2019 is registering NOW! We bring our loveable furry friends to your Church, school, store event, PTA Festival, Subdivision event, grand opening, spring festival and Fall events. 2 hours of cuddly PETTING starts at 410. Add 2 ponies for additional 200. for the two hours and then 120. per each additional hour. Hands on learning and animal husbandry! You will see goats and sheep, piggy, bunnies, donkeys, ponies, chickens, duckies,and pups! HANDS ON! YOUR GROUP is the ONLY GROUP HERE! PERSONALIZED! EVENTS HERE! RUSTIC WEDDINGS! ADOPTION PARTIES! WE have had many different events here! call text or email for pricing and info.